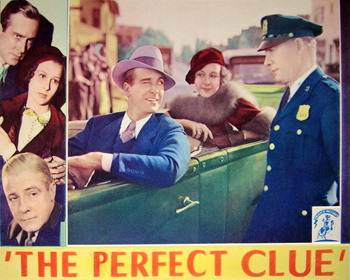 The Perfect Clue opens with wealthy young Mona Stewart (Dorothy Libaire) snubbing her father's bride-to-be and eloping with a family friend as revenge. After thinking about it, she gets off the train alone. Hiring a car to take her to the nearest city, the chauffeur David Mannering (DM) robs and dumps her on the side of the road. Listening to his conscience however, he returns and offers to take her on her way. Spending a lot of time together, the two fall in love and eventually find themselves behind bars, accused of murder. With help from the jilted fiancé both are eventually cleared of any involvement. Being cleared of murder charges can be a complicated process as any experienced Los Angeles criminal defense lawyer knows. Produced by the poverty-row company Majestic Pictures, The Perfect Clue was considered lost until recently when a 16 MM print was found. It is now available on DVD. Interesting is DM's character name of David Mannering. Surprisingly, Variety was not too unkind, "If forgiven for its fictional elements, things that people don't do except on the screen, The Perfect Clue is takeable. Dual bills will be its happiest location. Considerable action and just enough suspense to keep it rolling. Included is a chase in which the hero and heroine, for unexplained reasons, are running away from the cops. They do everything to try to convict themselves. Cast manages to keep the picture alive. David Manners and Dorothy Libaire are opposite each other with Skeets Gallagher heading the support." Purchase The Perfect Clue in DVD format through this Amazon.com link and a portion of the sale goes to the David Manners web site. Help support this site with your purchase.